Demonstration in support of immigrant workers. Michel Foucault in the foreground. Paris, 1973. Photo: Gilles Peress. Foucault in a discussion in the office of Libération, 1973. Roland Barthes (second L), Michel Foucault (second R) and Gilles Deleuze (R) invited by Pierre Boulez (L) for a cycle of five concerts-workshops devoted to musical time, IRCAM, Paris, Feb 1978. Michel Foucault (born Paul-Michel Foucault, 1926–1984) was a French philosopher, historian of ideas, social theorist, philologist and literary critic. His theories addressed the relationship between power and knowledge, and how they are used as a form of social control through societal institutions. Though often cited as a post-structuralist and postmodernist, Foucault ultimately rejected these labels, preferring to classify his thought as a critical history of modernity. From Foucault, Death and the Labyrinth: The World of Raymond Roussel, 2007, pp xxiii-xxvi; there derived from a chronology compiled by Daniel Defert in Foucault, Dits et écrits, t. 1, 1994, pp 13-64. 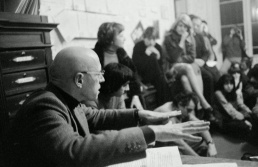 1926 Born to Paul-Michel Foucault and Anne-Marie Malapert in Poitiers, France. Summer, 1946 Entry into the Ecole normale superieure, Paris. 1948 Receives the licence in philosophy from the Sorbonne. 1949 Revises his thesis for the diplôme d'études supérieures in philosophy under one of his cherished mentors, Jean Hippolyte. 1952 Completes the diplôme in psychopathology at the Institut de psychopathologie in Paris; begins teaching in the Faculty of Letters at Lille. 1953 Completes the diplôme in experimental psychology at the Institut; offers a course at the Ecole normale supérieure. 1954 Publishes his first book (a revision of which will later be translated into English as Mental Illness and Psychology) and a long introduction to the French translation of the German existential psychoanalyst Ludwig Binswanger's Traum und Existenz. 1955 Assumes a post at the University of Uppsala, Sweden; begins three years as the director of the Uppsala Maison de France, an institute for the promotion of French culture. 1957 Encounters Raymond Roussel's La Vue; completes a draft of Folie et déraison (which will become Madness and Civilization in English). 1958 Spends a sojourn lecturing and traveling in Poland; shows Folie et déraison to the French historian of science Georges Canguilhem, who sees no need for revision. 1960 Completes his these secondaire on Immanuel Kant's Anthropology from a Pragmatic Point of View, first published in two parts in 1994 and 2008; assumes a post at a provincial university but continues to live in Paris. 1961 Submits Folie et déraison to his Sorbonne committee; enjoys positive reviews upon its publication. 1962 Befriends the philosopher Gilles Deleuze; gives a manuscript of Birth of the Clinic to his former professor, political theorist Louis Althusser. 1963 Sees the publication of Raymond Roussel and Birth of the Clinic; begins the prodigious research for what will become Les Mots et les choses; encounters the painting that will occupy its first pages, Velásquez's Las Meninas, during a visit to the Prado in Madrid. 1966 With Deleuze, begins work on a French edition of Nietzsche's complete works; sees Les Mots et les choses into print; finds himself labeled a "structuralist" and, in the words of Jean-Paul Sartre, "the last rampart of the bourgeoisie"; departs France in the autumn for a three-year sojourn in Tunisia. 1968 Returns in the aftermath of the student revolts to assume a post at the University of Nanterrre. 1969 Receives largely tepid reviews of The Archaeology of Knowledge. 1970 Accepts the nomination to a chair in the History of Systems of Thought at the most distinguished of French universities, the Collège de France; visits and lectures in Japan; delivers a version of "What Is an Author?" at SUNY Buffalo. 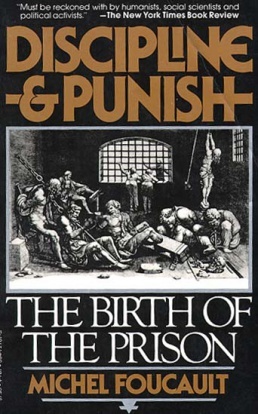 1971 Has his home serve as the seat of a newly founded prisoners' advocacy group, the Groupe d'information sur les prisons; engages in diverse dialogues with the French Maoists; begins a course on "penal theories and institutions" at the Collège; begins an acquaintance with writer Jean Genet; in the Netherlands, engages in a televised debate with Noam Chomsky. 1973 Visits Montreal and Brazil for the first time; witnesses the broad and enthusiastic reception of I, Pierre Riviere... in France. 1975 Provokes controversy with the publication of Discipline and Punish; visits Berkeley and other California universities; proposes a chair for Roland Barthes at the Collège. 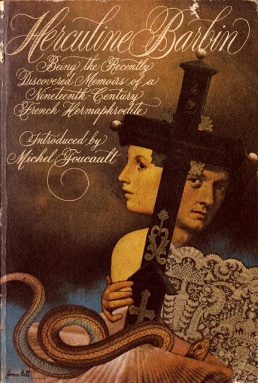 1976 Works with Michelle Perrot and Jean-Pierre Barouh on a reissue of Jeremy Bentham's Panopticon; provokes controversy again with the publication of the first volume of The History of Sexuality. 1978 Inaugurates the theme of governmentality with a course on "security, territory and population" at the Collège; begins to trace the genealogy of sexuality back toward antiquity; visits Iran in the months preceding the revolution, which he initially supports; recovers from the archives and publishes Herculine Barbin, dite Alexina B., the case of a nineteenth-century hermaphrodite; marches in favor of the acceptance of Vietnamese refugees into France. 1979 Grants an interview published in the first issue of the first French gay magazine, Le Gai Pied; delivers the Tanner lectures at Stanford. 1980 Delivers the Howison lectures at Berkeley to an overflowing crowd; delivers the James lectures at New York University. 1981 Calls for further support of the Vietnamese; advocates the cause of the Polish Solidarity movement. 1982 With historian Arlette Farge, publishes Le Désordre des familles, a collective commentary on a corpus of "poison-pen letters" recovered from the Bastille archives (English translation by Thomas Scott-Railton, 2016); Hubert Dreyfus and Paul Rabinow publish the record of his discussions with American interlocutors during the period as Michel Foucault: Beyond Structuralism and Hermeneutics. 1983 Delivers the Regent's Lectures at Berkeley in the spring; begins to suffer from persistent respiratory ailments. 1984 Temporarily revived with treatment, completes The History of Sexuality, Volume 2: The Use of Pleasure, and The History of Sexuality, Volume 3: The Care of the Self; abandons hope of completing the fourth volume, to have been entitled The Confessions of the Flesh; hospitalized on 3 June, Foucault dies twenty-two days later, not of cancer--persistent rumors and media reports (which misled Charles Ruas among others) aside--but of a septicemia characteristic of AIDS. Folie et déraison (see below). Principal doctoral thesis. Introduction à 'Anthropologie' de Kant, , 128 pp, typoscript, HTML. 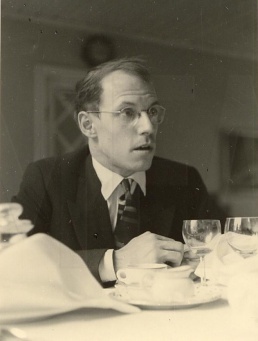 The Introduction, together with his translation of Immanuel Kant's Anthropologie in pragmatischer Hinsicht (1798), constituted Foucault's secondary doctoral thesis, which was supervised by Jean Hyppolite and submitted to the University of Paris, Sorbonne on 20 May 1961. "Introduction to Kant's Anthropology from a Pragmatic Point of View", trans. Arianna Bove, 2004, HTML. (English). Translated as part of Bove's doctoral thesis at the University of Sussex. Maladie mentale et personnalité, PUF, 1954, PDF. Maladie mentale et personnalité, Paris: PUF, 1954, PDF, ARG; 2nd ed. 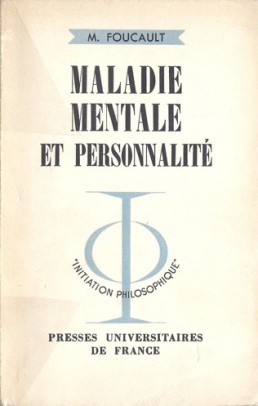 as Maladie mentale et psychologie, Paris: PUF, 1962; 1966. Histoire de la folie à l'âge classique, , Paris: 10/18, 1964. HF, Folie et déraison: histoire de la folie à l'âge classique, Paris: Plon, 1961; abridged ed. as Histoire de la folie, Paris: 10/18, 1964; 2nd, unabridged, ed. with a different preface and 2 appendices as Histoire de la folie à l'âge classique, Paris: Gallimard, 1972, 585 pp, ARG, PDF; ed. without the appendices, Gallimard, 1976, PDF; 1982. Review: Derrida (pp 36-76), . Madness and Civilization: A History of Insanity in the Age of Reason, trans. Richard Howard, Random House, 1965; New York: Mentor, 1965; intro. David Cooper, London: Tavistock, 1971; Plume, 1971; Vintage, 1988, ARG, PDF. (English). Trans. of the 1964 abridged edition, slightly augmented. History of Madness, ed. Jean Khalfa, trans. Jonathan Murphy and Jean Khalfa, London: Routledge, 2006, 725 pp, PDF, ARG. (English). Of the unabridged edition, with both prefaces, both appendices and another 2 texts. Reviews: Gordon, Brompton & Harefield NHS Trust, Deacon, Barham. Naissance de la clinique, PUF, 1963. 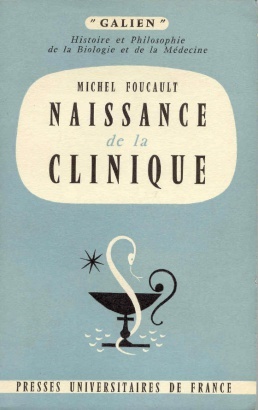 NC, Naissance de la clinique: une archéologie du regard médical, Paris: PUF, 1963. 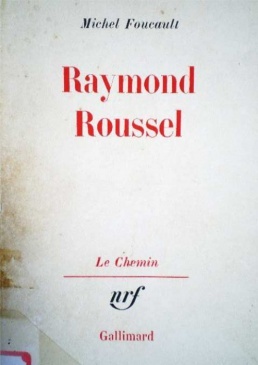 Raymond Roussel, Gallimard, 1963, PDF. Raymond Roussel, Paris: Gallimard, May 1963, 212 pp, PDF. The Order of Things, , Vintage, 1994, PDF. MC, Les mots et les choses. Une archéologie des sciences humaines, Paris: Gallimard, 1966, ARG, PDF. 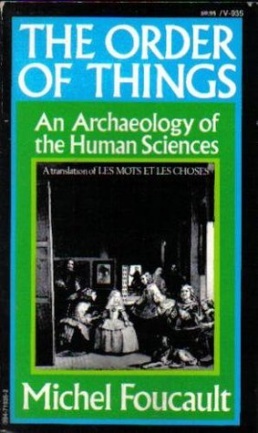 The Order of Things: An Archaeology of Human Sciences, London: Tavistock, 1970; New York: Pantheon, 1971, PDF; New York: Vintage, 1973; Routledge, 1989; New York: Vintage, 1994, PDF; Routledge, 1989; Vintage, 1994; Routledge, 2002; Routledge, 2005, ARG, PDF. (English). 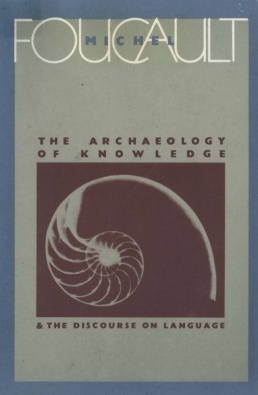 The Archaeology of Knowledge, , Pantheon, 1972, Log, PDF, ARG. AS, L’Archéologie du savoir, Paris: Gallimard, March 1969, PDF, PDF, ARG; repr. in Foucault, Œuvres II, Paris: Gallimard, 2015. Menggugat sejarah ide, trans. Inyiak Ridwan Muzir, Yogyakarta: IRCiSoD, 2002, 306 pp. (Indonesian). Trans. of the 1976 English edition. 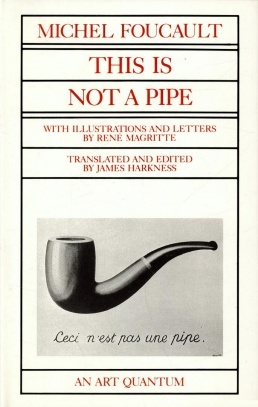 This Is Not a Pipe, , U California Press, 1983, ARG, PDF. Ceci n’est pas une pipe, Montpellier: Fata Morgana, 1973. Discipline and Punish, , Vintage, 1995, ARG, PDF. SP, Surveiller et punir: naissance de la prison, Paris: Gallimard, February 1975, ARG, PDF. 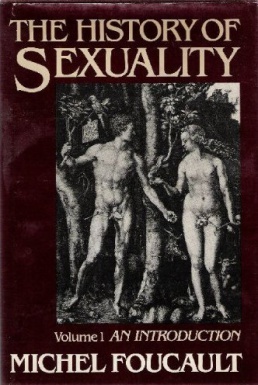 The History of Sexuality, 1: An Introduction, , Pantheon, 1978, ARG, PDF. The History of Sexuality, 2: The Use of Pleasure, , Pantheon, 1985, ARG, PDF. 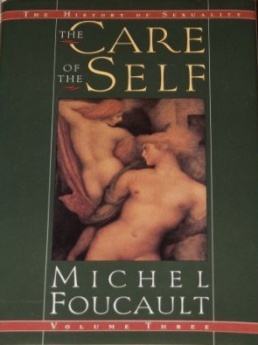 The History of Sexuality, 3: The Care of the Self, , Pantheon, 1986, ARG, PDF. HS1-4, Histoire de la sexualité, Paris: Gallimard, 4 vols., 1976-84 (1-3) & 2018 (4). Vol. 1, La volonté de savoir, 1976, 224 pp, ARG, PDF, ARG/EPUB. Vol. 2, L'Usage des plaisirs, 1984, 296 pp, ARG/EPUB. Vol. 3, Le Souci de soi, 1984, 288 pp, ARG/EPUB. Seks dan kekuasaan: sejarah seksualitas, trans. Rahayu S. Hidayat, Jakarta: Gramedia, 1997, 205 pp. (Indonesian). Trans. of Vol. 1.
vol. 1, Voinţa de a şti, 161 pp, PDF, PDF, ARG. vol. 2, Practicarea plăcerilor, 240 pp, PDF, PDF, ARG. vol. 3. Preocuparea de sine, 239 pp, PDF, PDF, ARG. Ingin Tahu: Sejarah Seksualitas, Jakarta: YOI, 2008. (Indonesian). Trans. of Vol. 1. Moi, Pierre Rivière.., Gallimard, 1973. Moi, Pierre Rivière, ayant egorgé ma mére, ma soeur et mon frére. Un cas de parricide au XIXe siècle, Paris: Gallimard, 1973, 424 pp, HTML; Paris: Gallimard, 2007. Politiques de l'habitat (1800-1850), Paris: Comité de la recherche et du développement en architecture, 1977, 324 pp. Herculine Barbin.., , Pantheon, 1980. Cover by Louise Fili. Adélaïde Herculine Barbin: Mes souvenirs, Paris: Gallimard, 1978; 2002, Scribd. with Arlette Farge, Le Désordre des familles. Lettres de cachet des Archives de la Bastille au XVIIIe siècle, Paris: Gallimard, 1982, 364 pp, Introduction, 2014. .
"Qu'est-ce qu'un auteur? ", Bulletin de la Société française de philosophie 63:3 (1969), pp 73-104; repr. as Qu'est-ce qu'un auteur?, Paris: Armand Colin, 1970; repr. in Foucault, Dits et écrits, I, texte n°69, HTML; different version in Foucault, Dits et écrits, III, texte n°258, HTML. Given before the Society at the Collège de France on 22 February 1969, with Jean Wahl presiding. L'ordre du discours, Gallimard, 1971, ARG. [L'ordre du discours], . Inaugural lecture given at Collège de France on 2 Dec 1970. 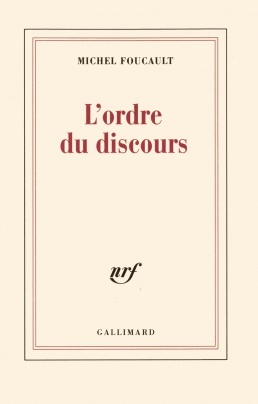 L'ordre du discours, Paris: Gallimard, 1971, ARG. Resumés des cours au Collège de France, 1970-1982, Paris: Julliard, 1989. [La volonté de savoir], [1970-71]. Weekly lectures, 9 December 1970 – 17 March 1971. [Théories et institutions pénales], [1971-72]. Lectures given Nov 1971 - Mar 1972. Théories et institutions pénales. Cours au Collège de France. 1971-1972, eds. François Ewald and Alessandro Fontana, Paris: Seuil/Gallimard, 2015, 327 pp, ARG. [Il faut défendre la société], [1975-76], MP3, MP3. [Sécurité, territoire, population], [1977-78], MP3. [Naissance de la biopolitique], [1978-79], MP3. [Du gouvernement des vivants], [1979-80]. [Subjectivité et vérité], [1980-81], (forthcoming). [L'herméneutique du sujet], [1981-82], MP3. [Le gouvernement de soi et des autres], [1982-83], MP3. Le gouvernement de soi et des autres, ed. Frédéric Gros, Paris: Seuil/Gallimard, 2008, ARG. [Le courage de la vérité], [1983-84], MP3. "Des espace autres", , Architecture, Mouvement, Continuité 5 (October 1984), pp 46-49, HTML. (French). Written in 1967. The text was the basis of a lecture given in March 1967. 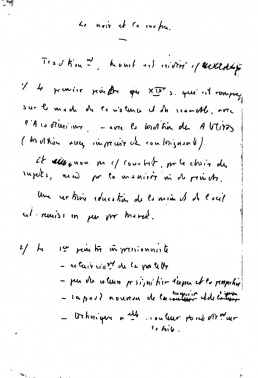 Manuscript page from "Le noir et la surface", 1971. "Le noir et la surface" & "La peinture de Manet", , Cahiers de L’Herne, 2011, PDF. "La vérité et les formes juridiques", in Dits et écrits, t. 2, texte n°139, 1994, HTML. Given at a conference in Rio de Janeiro, 21-25 May 1973. The Politics of Truth, [1978-84], ed. Sylvère Lotringer, intro. John Rajchman, trans. Lysa Hochroth & Catherine Porter, Los Angeles: Semiotext(e), 2007, PDF. (English) A collection of lectures and essays on Kant: a lecture given to the French Society of Philosophy on 27 May 1978; the essay "For an Ethics of Discomfort" (1979); two Dartmouth College lectures given on 17 and 24 Nov 1980 (repeated in a slightly different version at Berkeley on 20-21 Oct 1980); an interview conducted by André Berten at U Leuven in 1981; a lecture given at the Collège de France (1983); and the essay "What is Enlightenment" (1984). L'Origine de l’herméneutique de soi: Conférences prononcées à Dartmouth College, 1980, eds. Henri-Paul Fruchaud and Daniele Lorenzini, Paris: J. Vrin, 2013, 168 pp. Technologies of the Self: A Seminar with Michel Foucault, , eds. Luther H. Martin, Huck Gutman and Patrick H. Hutton, University of Massachusetts Press, 1988, 166 pp, PDF. (English). Given at the University of Vermont in autumn 1982. Léo Spitzer, Études de style, Paris: Gallimard, 1962. "Introduction", in Ludwig Binswanger, Le rêve et l'existence, Paris: Desclée de Brouwer, 1954. "Introduction", in Jean-Jacques Rousseau, Rousseau juge de Jean-Jacques. Dialogues, Paris, 1962, pp VII-XXIV. "Préface à la transgression", Critique 195-196: "Hommage à Georges Bataille" (1963), pp 751-769; repr. 1991. The essay reprinted as Préface à la transgression, Paris / Fécamp: Lignes, 2012, 64 pp. "La pensée du dehors", Critique 229 (Jun 1966), pp 523-546; repr. in Foucault, Dits et écrits, I, texte n°38, PDF. 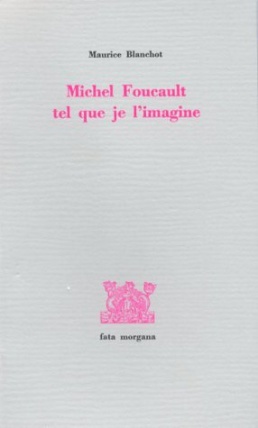 Printed in book form as Foucault, La pensée du dehors, Fata Morgana, 1986. "Un fantastique de bibliothèque", Cahiers Renaud-Barrault 59, Paris: Gallimard, Mar 1967, pp 7-30; repr., slightly abridged, as "La Bibliothèque fantastique", pref. to Gustave Flaubert, La tentation de Saint Antoine, Paris: Livre de Poche, 1971, pp 7-33; repr. as Foucault, La Bibliothèque fantastique. À propos de La Tentation de saint Antoine de Gustave Flaubert, Brussels: La Lettre Volée, 1995, 36 pp, PDF. "Fantasia of the Library", in Foucault, Language, Counter-Memory, Practice: Selected Essays and Interviews, Cornell University Press, 1977, pp 87-109, PDF. "Nietzsche, Freud, Marx", in Cahiers de Royaumont, t. 4: Nietzsche, Paris: Minuit, 1967, pp 183-200, HTML. The essay stems from the July 1964 Royaumont colloquium. "Nietzsche, la généalogie, l’histoire", in Homage à Jean Hyppolite, ed. S. Bachelard, et al., Paris: PUF, 1971, pp 145-172, PDF. Along with "Réponse au Cercle d'épistémologie" , which became the introductory chapter of The Archaeology of Knowledge, this essay represents Foucault's attempt to explain his relationship to those sources which are fundamental to his development. "Qu'est-ce que les Lumières? ", Magazine littéraire 207 (1984), pp 35-39. "Qu'est-ce que la critique? Critique et Aufklärung", Bulletin de la Société francaise de Philosophie 2 (1990), PDF; repr. in Qu'est-ce que la critique? suivi de La culture de soi, eds. Henri-Paul Fruchaud and Daniele Loren, Paris: Vrin, 2015, PDF, ARG. First given at conference on 27 May 1978. Tome 1: 1954-1969, 1994, 855 pp, ARG. Tome 2: 1972-1975, 1994, 838 pp, PDF, ARG. Tome 3: 1976-1979, 1994, 836 pp, PDF, ARG. Tome 4: 1980-1988, 1994, 896 pp, PDF, ARG. Band 1, 1954-1969, 2001, 1075 pp, PDF, ARG. Band 2, 1970-1975, 2002, 1031 pp, PDF, ARG. Band 3, 1976-1979, 2003, 1979 pp, PDF, ARG. Band 4, 1980-1988, 2005, 1136 pp, PDF, ARG. Vol. I, Ethics: Subjectivity and Truth, ed. Paul Rabinow, 1997, PDF, ARG. Vol. II, Aesthetics, Method, and Epistemology, ed. James D. Faubion, 1998, PDF, ARG. Vol. III, Power, ed. James D. Faubion, 2000, PDF, ARG. Michel Foucault. Philosophie, eds. Arnold Davidson and Frédéric Gros, Paris: Gallimard, 2004. [Le corps utopique], broadcast, 21 Dec 1966. Recording released on Michel Foucault, Utopia: et Heteroropies, CD, Institut National d‘Audiovisuel, Paris, 2004.
with Blandine Barret Kriegel, Anne Thalamy, François Beguin and Bruno Fortier, Les machines à guérir. aux origines de l'hôpital moderne, Paris: Institut de l'Environment, 1976, 241 pp; Brussels: Pierre Mardaga, 1979, 184 pp. Preface to Q.H.S. [Quartier de Haute Sécurité], by Roger Knobelpiess, Paris: Stock, 1982. Sept propos sur le septième ange, Montpellier: Fata Morgana, 1986. Foucault on Bachelard, video, 2 min. Le beau danger: Entretien avec Claude Bonnefoy, , Paris: EHESS, 2011, 72 pp. "Par-dela le bien et le mal", Actuel 14 (November 1971), pp 42-47; republished with slight modifications as «Entretien» in: C’est demain la veille, Paris: Seuil, 1973, pp. 19-43.
with Fons Elders, Freedom and Knowledge: A Hitherto Unpublished Interview, , ed. & comm. Fons Elders, trans. Lionel Claris, intro. Lynne Huffer, Amsterdam: Elders Special Productions, 2013. Online (part. ), Introduction. "Human Nature: Justice Versus Power", in Reflexive Waters: The Basic Concerns of Mankind, ed. Fons Elders, London: Souvenir Press, 1974; repr. as a single volume as Human Nature: Justice vs Power. The Chomsky-Foucault Debate, ed. Fons Elders, London: Souvenir Press, 2011. (English) Review: Sørensen (FS). with Gilles Deleuze, "Les Intellectuels et le pouvoir", L'Arc 49 (May 1972), pp 3-10, HTML; repr. in Collectif Arc, Gilles Deleuze, Paris: Inculte, 2005, pp 23-39, PDF. Recorded 4 March 1972. C'est demain la veille. 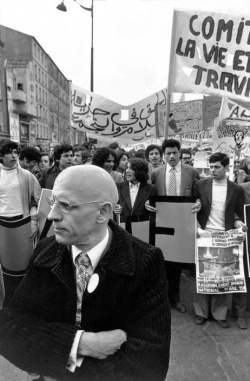 Entretiens avec Michel Foucault. Paris: Seuil, 1973, 200 pp. 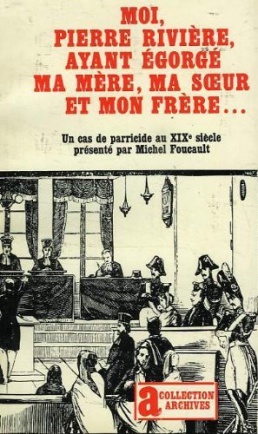 Roger-Pol Droit, Michel Foucault: entretiens, Paris: Odile Jacob, 2004, 160 pp. Contains interviews given in 1975. "Dialogue sur le pouvoir", trans. F. Durand-Bogaert, Dits et écrits, III, texte n°221, 1994, HTML. with Bernard Henri-Levy, "Non au sexe roi", Le nouvelle observateur, 12 Mar 1977.
with Guy Hocquenghem and Jean Danet, "La loi de la pudeur", Recherches 37 (April 1979). Presented on radio on France Culture on 4 April 1978.
with Jean Le Bitoux, "Le gai savoir", , Mec 5 (June 1988), pp 32-36, and Mec 6-7 (July-August 1988), pp 30-33, ARG. "The Gay Science", trans. Nicolae Morar and Daniel W. Smith, Critical Inquiry 37:3 (Spring 2011), pp 385-403, PDF. (English). Recorded in July 1978.
with Colin Gordon and Paul Patton, "Considerations on Marxism, Phenomenology and Power", , Foucault Studies 14 (Sep 2012), pp 98-114, ARG, PDF. (English). Recorded 3 April 1978. L'Impossible prison: recherches sur le système pénitentiaire au XIXe siècle, , ed. Michelle Perrot, Paris: Seuil, 1980, 320 pp. Review. Transcript of a roundtable held 20 May 1978.
with Didier Eribon, "Est-il donc important de penser? ", Liberation, 30-31 May 1981, p 21.
with Pierre Boulez, "La musique contemporaine et le public", C.N.A.C. Magazine 15 (May-June 1983), pp 10-12, HTML. "La música contemporánea y el público", trans. Diego Tatián, Nombres 16:20 (August 2006), pp 197-206, PDF, PDF. with Raúl Fornet-Betancourt, Helmut Becker and Alfredo Gomez-Müller, "The Ethic of Care for the Self as a Practice of Freedom", , trans. J. D. Gauthier, Philosophy & Social Criticism 12 (July 1987), pp 112-131, ARG; repr. in The Final Foucault, eds. James William Bernauer and David M. Rasmussen, MIT Press, 1988, pp 1-20. (English). Given 20 January 1984.
with Alessandro Fontana, "Une esthétique de l'existence", Panorama 945 (28 May 1984); repr. Le Monde, 15-16 July 1984, p XI; repr. in Dits et écrits, t. 4, texte n° 357, 1994, HTML. Given 25 April 1984.
with Alain Badiou, on Philosophy and Psychology, French TV, 1965.
with Fons Elders, on Freedom and Knowledge, Dutch TV, 1971. [Rabinow Seminars & Recordings], , MP3. Paul Veyne, Comment on écrit l'histoire: essai d'épistémologie, Paris: Seuil, 1970; new ed. as Foucault révolutionne l'histoire, 1978; exp. ed., 1979; 1996. Foucault rewolucjonizuje historię, trans. Tomasz Falkowski, Toruń, 2007. (Polish). Of the 1979 edition. Dominique Lecourt, Pour une critique de l’épistémologie: Bachelard, Canguilhem, Foucault, 1972, Paris: Maspero; 5th ed., 1980. Marxism and Epistemology. Bachelard, Canguilhem and Foucault, trans. Ben Brewster, London: NLB, 1972, 223 pp, PDF. (English). Review, Review. 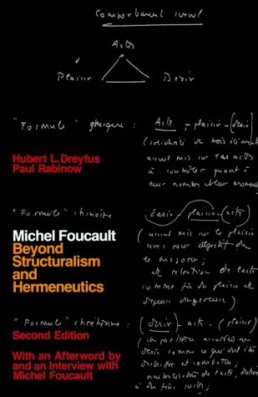 Hubert L. Dreyfus, Paul Rabinow, Michel Foucault: Beyond Structuralism and Hermeneutics, 2nd ed., 1983, PDF. Michel Foucault, un parcours philosophique: au-delà de l'objectivité et de la subjectivité, trans. Fabienne Durand-Bogaert, Paris: Gallimard, 1984. Gilles Deleuze, Foucault, , 2004, ARG, PDF. Gilles Deleuze, Foucault, Paris: Minuit, 1986; 2004, 141 pp, ARG, PDF. Foucault, trans. José Vázquez Pérez, Barcelona: Paidós Ibérica, 1987, PDF, ARG. (Spanish). Maurice Blanchot, Michel Foucault tel que je l'imagine, 1986, PDF. Maurice Blanchot, Michel Foucault tel que je l'imagine, Fata morgana, 1986, PDF. With illustrations by Jean Ipoustéguy. François Ewald (ed. ), Michel Foucault philosophe, Paris: Seuil, 1989. 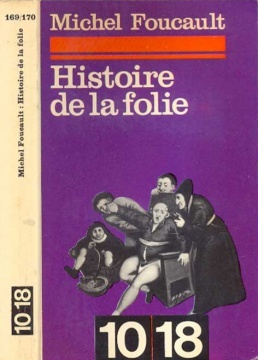 Penser la folie: Essais sur Michel Foucault, Paris: Galilée, 1992, 208 pp. , Review, Introduction translated into English. Essays by François Bing, Georges Canguilhem, Jacques Derrida, Arlette Farge, René Major, Agostino Pirella, Jacques Postel, Claude Quétel, and Élisabeth Roudinesco. Jean Zoungrana, Michel Foucault. Un parcours croisé: Lévi-Strauss, Heidegger, Paris: L'Harmattan, 1998, PDF. Pierre Billouet, Foucault: figures du savoir, Paris: Belles lettres, 1999, PDF, PDF, ARG. Judith Revel, Le vocabulaire de Foucault, Paris: Ellipses, 2002, PDF, PDF, RTF. François Boullant, Michel Foucault et les prisons, Paris: PUF, 2003. Didier Eribon, Roger Chartier (eds. ), Foucault aujourd'hui. Actes des neuvièmes rencontres INA-Sorbonne, 27 novembre 2004, L'Harmattan, 2006. Isabelle Garo, Foucault, Deleuze, Althusser & Marx. La politique dans la philosophie, Paris: Démopolis, 2011, 432 pp, ARG. Review. Geoffroy De Lagasnerie, La dernière leçon de Michel Foucault. Sur le néolibéralisme, la théorie et la politique, Paris: Fayard, 2012, 178 pp, ARG. Didier Eribon, Michel Foucault, 1926-1984, Paris: Flammarion, 1989; new ed., Paris: Champs-Flammarion, 2011. Didier Eribon, Michel Foucault et ses contemporains, Paris: Fayard, 1994. Paul Veyne, Foucault, sa pensée, sa personne, Albin Michel, 2008, 214 pp. Collection of writings on Foucault on Aaaaarg. Foucault Studies, ed. Sverre Raffnsøe, since 2004. Deleuze's seminars on Foucault [Oct 1985-Jan 1986]. Audio files with transcripts. Beyond Good and Evil, dir. David Stewart, 1993. Bibliography of the texts by Foucault and their German translations. Compiled by Michael Buchmann. Foucault's shorter works in English. Compiled by Richard A. Lynch (at Michel-Foucault.com). On Foucault's work Compiled by Jeffrey Hearn. At Polylogos.org. Maintained by Gen Nakayama. Resources on Michel Foucault, Department of Communication Studies, University of Minnesota. Foucault-L, mailing list, est. 1993. This page was last modified on 7 April 2019, at 19:35. This page has been accessed 283,343 times.